Featured musician of the month - "Rhythm Ryders Band"
SEE PLAY -"SAM DASHES OFF INTO HISTORY?" Also with a songbook with drawings by students that can be used as a coloring book and including Word search activity page for each song. The CD will have one poem and 16 songs that range from a musical timeline from 1803, with Thomas Jefferson and the Lewis and Clark Expedition to 1870 and the Transcontinental Railroad. The songs will have a comtemporary feel along with traditional and will get the Musical Brain going! 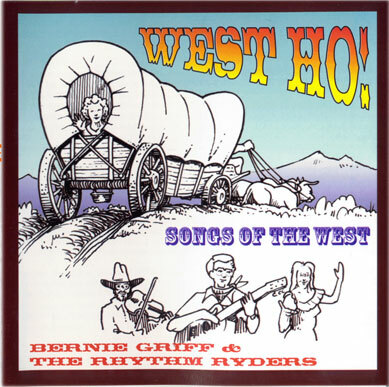 All songs written by Bernie Griff except "The Empire Mine" by Don Armstrong and Instrumental "The Oregon Trail Hornpipe by Mark Masarek & Bernie Griff. CD INFORMATION: "WEST HO! AND SONGS OF THE WEST"
The CD has 16 songs plus the poem "Where Did The West Begin" with a zesty instrumental background of guitar, fiddle and banjo which will set an enchanting Western mood for the CD. It is narrated by Dale Pryor who is a direct descendant of Sargeant Nathaniel Pryor, a member of the Lewis and Clark Expedition. Dale is an Oklahoman with a town in Oklahoma named after his family - Pryor, Oklahoma. As you can see from the titles there are some novel touches to this historical coverage of the CD: "Lotta Crabtree, the Elfin Entertainer", "The Oregon Trail Hornpipe", an orginal hornpipe by Mark Masarek and I, "Nellie Cashman, the Saint of the Sourdoughs", and "Black Bart, thePo8", to name a few. "West Ho! and Songs 0f The West" is a musical treat that I think you will agree will be a feast for the senses and bring the West into a new perspective for students, teachers and other folk interested in enjoying songs of the West. 1. COLONEL ALEXANDER MAJORS - of the Russell, Majors and Waddell Pony Express enterprise. 2. SAM HAMILTON - Pony Express rider who is honored with a statue in Old Sacramento. 3. SAMUEL F. B. MORSE - Inventor of the telegraph. 10. MAN AT DINNER TABLE - Scientist who gave Morse an idea! 13. EZRA CORNELL - Worked with Morse on the Wash. D.C. link to Baltimore. 14. SENATOR -Announces award to Ezra Cornell. 18. EDWARD CREIGHTON - His Telegraph company won race from St. Jo to Salt Lake on October 17, 1861. (James Gamble's California Company arrived on October 23, 1861.). YOUR ENTIRE CLASS CAN TAKE PART IN THESE HISTORICAL EVENTS IN THE PLAY! Gary and Marilynn Venden came to Fiddlewest Studios in August of 1997 and recorded "Lotta Crabtree", "By The Great Horn Spoon", and "Sam Hamilton's Ridin' " (For The Pony Express). Their voices and musicianship take the "West Ho & Songs of the West" CD to a special place and help to continue the spirit of the west in this panorama of time from 1804 to 1875. Gary's ideas for arranging and vocal effect gave the songs a wonderful western flavor. His guitar work also accents throughout ByThe Great Horn Spoon and Lotta Crabtree. We had a great time in San Geronimo and I can't thank them enough for all the effort and expertise as well as their obvious talent. Marilynn's rendition of Lotta Crabtree brings back the times and you can just picture little Lotta singing her heart out for the 49'ers as Marilynn sings: "...Fairy star of the Mother Lode...Dancin' for the Miners...Singing a tune to clappin' hands...of the 49'ers..."
Gary made it over to Kate's Cafe in San Geronimo to perform every stime he got a chance and we gave a debut to West Ho there, singing "By the Great Horn Spoon" just before he and Marilynn left for their new home in Glendale, Arizona where he is now Pastoring a new Church there. Gary and Marilynn have created and produced several recordings and CD's. Pictured above is one of my favorites - QUIET TIME. Gary did the final Mixdown on the project at Fiddlewest Studios right in San Geronimo. Thanks to his fine recording equipment and sound engineering the project became a reality. Gary - I can't thank you enough but you are a good friend and I consider myself very fortunate to have all your help. Best of luck on your next CD which you and Marilynn are in the midst of working on and I sure hope you get the time to do it! Featured for month of July - Bobby Lee - Pedal Steel Guitarist from Somoma County.